Will the global casino come to its end at short notice? 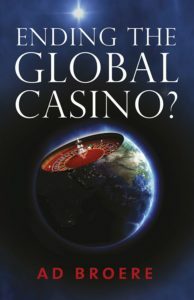 ‘Ending the global casino’ was published in 2010. Many then still believed in the full recovery of the economy. Meanwhile the ultra rich went on robbing the masses all over the world. Five years after 2010 according to Oxfam the richest 1% has become wealthier than the rest of the world. The threat of a complete disaster is imminent. Unless we change our attitude towards money and value completely. Money is not a product, you do not harvest money like apples from a tree. Money comes from thin air. That is why it should not be treated as if it were a product. Asking money for money is, seen from this point of view, ludicrous. The main driving force behind the financial system is the continuous trade-off between risk and return. Investors always seek to balance the amount of risk they are willing to accept and the expected return on investment. The bigger the risk, the higher the expected return. There is always a limit to the risk an investor is willing to take. Banks, for example, should be risk avoiding, because of their financial structure. Their debt is much higher than their equity, technically expressed as a high leverage. Losses on loans to customers have a direct impact on the financial position of banks. The relatively small equity of the bank will be gone soon if they have to write-off huge amounts of the loans granted. Because of the limited risk, banks require a relatively low return on loans compared to that what an investor in shares requires of a business with high risk perceived. Therefore as long as they do what they are supposed to do, banks will never ask relatively high returns on their investments in loans. Yet, during the past decades banks have moved from their conservative positions in the direction of a more investor- like approach. Attracted by the high returns big commercial banks have been acting more and more as investment bankers. However, there has been just one big difference with the private investor. Banks conduct their business with money that is not theirs, whilst private investors take risks with money that is generally their own. What banks actually did was go for short term profit, at the same time covering up the increasing risks. The constructs they invented to camouflage the bad news were smart if not cunning. The good news was prominently displayed. For example pension funds all over the world purchased huge amounts of collateralized debt obligations (CDOs), because of their high return combined with low risk. That is, seemingly because institutes such as Moody’s mentioned above gave them mainly a triple A (=excellent) status. As long as things went well in the booming economy of the past decades, profits were huge for the bankers and their shareholders. 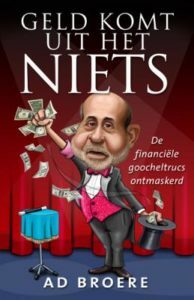 All financial products, whether they were collateralized debt obligations, credit default swaps or any other creation designed by the financial ‘wizards’ brought lots of money in the short term, and at the same time lots of risk in the long term. The financial crisis in 2007 seemingly made an end to the long years of misuse. Taxpayers’ money saved the banks in many countries all over the world. That is, for the time being. Since basically nothing has changed after the financial crisis, and banks went on to do business as usual the second outburst may be expected, even in the short term. William White is concerned about a second crisis. Though in his view a deep crisis might be necessary to make a new and better start, he indicates that they have caused huge political and social problems, and even wars in the past. The instabilities William White talks about are due to the behaviour of banks, but also to that of private investors. The latter also seek high returns combined with as low as possible risks. The richer a private investor, the more tools he has to reach that goal. The hedge funds mentioned before accept only investors with very high incomes and capitals. The reason for that is obvious. The more an investor has, the better the hedge fund can rule out risks. For that purpose they have a multitude of tools available, for example, swaps, caps, collars etc.. In this context I will not discuss this further. You might say that hedge funds are generally always on the winning side, regardless the state of the economy. Stock exchanges have become more of a casino than a meeting place between investors and companies that seek capital. Investors are mainly not interested in the company they put their money into. The profit between buying and selling is the interest of most investors. The nervous trade over the past decades in shares, options and other financial products aimed at short term success, has also caused much instability. The results of the large pharmaceutical corporation Novartis underlines the distance between the investor in shares and the reality of the company itself. In 2009 Novartis made a profit of $ 8.4 billion. At the end of 2009 there were 2,267,855,586 (more than 2.2 billion) shares in circulation. All those shares are at bearer, which means that you cannot identify who owns them. Novartis paid out more than 52% of their profit to the shareholders in dividends or $ 4.5 billion. A huge amount of money. However, this is just $ 1.95 per share. The price per share for Novartis shares is around $ 53.50. The return on investment for an investor that bought the share for that price is 3.6%. This shows how the dilution of mega profits into small returns works. It speaks for itself that investors of ‘the first hour’ who bought their shares many years ago for a relatively low price, earn a lot on their investment. Often these investors hold a relatively large number of shares in one or more corporations. The mega number of total shares issued by nearly all big corporations is to their advantage, because they can stay hidden as long as the shares they hold do not exceed a substantial interest, generally 5%, for Novartis more than 113.4 million shares. Furthermore, there are constructs to spread the shares over more trusts, funds, foundations, etc.. These shareholders also exert influence on the companies’ management via these vehicles. This is how the financial elite has established its position in the real economy. On Thursday Warren Buffet paid up on his annual charity luncheon event. Attending was Zhao Danyang, a Chinese Hedge Fund manager who donated $2.11 million to one of Mr. Buffet’s favorite charities in return for the privilege of inviting 7 friends and relatives to lunch with the Oracle of Omaha at Smith and Wollensky in NYC. Zhao, an astute and long term investor in China through his $130 million hedge fund, has generated 600% returns over the past 6 years. Zhao views Buffet as his teacher, and has credited him with the inspiration required to be a successful investor. Perhaps there’s a lesson here for all of us- the longer term view might be the way to generate real wealth, if we can take a cue for Mr. Buffet and Mr. Zhao. During the lunch, The Oracle commented Mr. Zhao is lucky to be living in the “Era of Chinese Ascendancy”. Buffet stated he believes the next few decades in China will provide the same kinds of opportunities the last few decades provided Mr. Buffet in the United States. For smaller investors the stock exchange is no more than a big casino, with a bigger chance of losses than profits. The price of shares is so high compared to the real value of them that the only chance to get positive results is to gamble on positive margins between selling and buying. This pertains to shares as well as to options. The last few years have proven again that this game sorts out more disappointment than luck. Greed, short-sightedness, selfishness have made a monster of the financial system. The aftermath of the present crisis has proven that basically nothing has changed. Therefore I share William White’s view that if a complete change in awareness does not develop, the whole economy might be destroyed completely. I have used several times the term ‘the real economy’ several times. What is it in fact? The real economy might be defined as the process of all goods and services produced by organisations/businesses, and consequently, bought by consumers. The goods and services produced should have value for the buyer,otherwise he or she would not be inclined to buy. For example, if a theatre company produces a play, there has to be interest in the play, or the company is not successful. If the number of visitors is as expected, the theatre company has apparently created value. Another example is a new business that introduces a environmentally friendly produced bio-fuel. 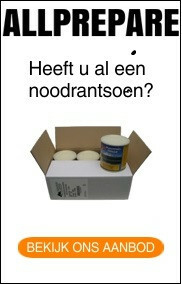 If there are enough buyers willing to pay the relatively high price for this fuel, the new business has created value. The second question is: who is ‘the business’ or ‘the theatre company’ or ‘the hospital’ etc.? Any organisation can only exist because of the people that work for it. Even in organisations that are automated to a high extent, people are at the basis of the value creation that takes place in it. Consequently, organisations can be regarded as by people driven value chains. A value chain can be defined as the chain of activities by which a company buys in materials, creates a good or service, markets it, and provides services after a sale is made. Each step creates more value for the consumer. If you examine the activities, they are all driven by people within the organisation, regardless of the level of automation of the processes, and not by money. Not by loans from banks, neither from money from investors in equity. Money does not create value. Why then do investors require such a big part of all the value added by an organisation? 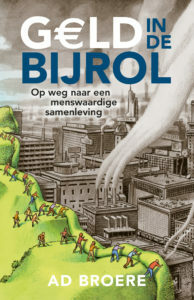 Oil and gas company Shell, for instance, earned $19.1 billion for its shareholders and paid $ 10.6 billion to its staff (including top management) in 2009; food company Unilever paid € 5.2 billion to its employees and earned in the bad year 2009 its shareholders € 4.1 billion. In the year 2007 when the financial crisis hit the world bank corporation HSBC earned $20.5 billion for its shareholders and paid $ 18.5 billion to its staff. Apparently we do think that investors are more entitled to the value added of a company than the employees are. Because we collectively believe that money can make money, it happens the way it does. There are just a few who wonder why people do not receive a bigger part of the value created by them instead of the money providers. Also peculiar is the distribution of incomes within a company. This is completely uneven. The board of management in most of the corporations earn 50-60 times more money than the other employees. This underlines that not only shareholders, but also those who guard the shareholders value get the bigger part of the value added. Not all shareholder/owners of companies have the same idea about what they are entitled to because of their ownership. An example of someone who had a different view on this was Scott Bader in the U.K. In 1951 the Swiss Ernest Bader gave all his shares in the company (his wife’s name is Scott, hence the company’s name Scott Bader), owned by him and his wife, to the collectivity of their employees. The trust in which all the shares were put were called a commonwealth, making clear that the gains in shareholder value were for the benefit of all employees. Bader was convinced that capital should not be the owner of labour. In his vision earning money with money leads to inequality, jealousy and conflicts. Furthermore, he decided that the ratio of the highest wages to the lowest should not be more than 7:1, which is in sharp contrast to today’s practice in many organizations. Bader also tried to educate the employees in what today is called social governance. They were entitled to 40% of the net profit. However half of this amount was destined to contribute to projects in developing countries, for example a clean water project in Africa. The employees could choose which project they wanted to contribute to. The other half of the 40% was to be paid out to the employees at year’s end. The remaining 60% of the profit was retained in the business to make the company financially stronger and more independent of banks. According to the website www.scotbader.com the original socio-economic ideas of Ernest Bader have survived the nearly sixty years since the creation of the commonwealth, and the company is still lively in business. Today Scott Bader employs 600 people worldwide, and has manufacturing sites in Europe, Middle East, and South Africa. The turnover is € 220 million (2010). It is surprising that so little attention has been paid to this successful experiment. It has proven that the separation between capital and labour is not ‘nature’s way’. It only serves those who want capital ‘to work for them’. But have you ever seen a euro, a pound, or a dollar working? The idea that people who create value are entitled to the returns it gives, was brought into practice by Ernest Bader. By doing this he was far ahead of his time. Today reluctantly some companies allow their employees to participate in the companies’ capital. And those who have decided this are generally not disappointed about the decision. The number of Dutch companies that offer employee participation in their capital has been doubled during the last ten years, concludes Eric Kaarsemaker in research done for the University of York (U.K.) Those companies experienced an improved motivation and commitment by their employees. Another example of the value chain approach wherein the employees and not shareholders nor management play the leading part is Semco. o No mix of business and private life. o Just do where you really believe in. o Don’t wait until you are old to enjoy your retirement. The idea is that you can take advantage of it once a week, from any age. The basis of his altered attitude was the awareness that his employees were the backbone of the business. By really treating them as grown-up people, who can take their own responsibilities, make their own decisions, are creative if they are not drowned in codes of conduct and accountability, the organisation he had in his mind could develop. During the years that followed, everything was under discussion, nothing had to stay as it was. Step by step Ricardo Semler democratised Semco, resulting in a completely flat, non-hierarchical organisation. People have to learn how to develop as free and creative beings. The most important thing is that those who are leading such a process repeatedly tell them that ‘nothing is because it is’. Anything is open for discussion. For example, why have a head office accepting a loss of time and health through long traffic jams, when people can work at home and communicate through internet? Or, why should people be managed by someone higher in the hierarchy if they are perfectly able to cooperate and make decisions without a leader? Semco has taken leave of the old-fashioned controller-style manager. Managers have a coordinating role, and their performance is evaluated by the employees. Furthermore, Semco is organized in small autonomous units. The basic idea is that a manager is not able to manage hundreds of people in a humane way. That is, not by numbers, targets, accountability, and control mechanisms. Of course there has been much criticism of Ricardo Semler and Semco. Semler’s approach would only be applicable in small businesses, people need management, and need to be controlled and be accountable. The reality of Semco today makes short shrift of these criticisms. Sales have increased by over 600 percent over the last ten years while profits are up 500 percent. The annual growth rate has been at 24 percent over the past decade and turnover is now over $ 200 million. This is up from $ 4 million when Ricardo Semler took over the company. Employee turnover is very low. Semco is Brazil’s most popular employer. There are 2,000 applications on file. There is a turnover rate of less than 1% of the 3,000 employees working for Semco presently. Ricardo Semler responds to the outside criticism by pointing to the fact that hierarchically led businesses with a strong leader often fail after the leader leaves.He also states that traditional businesses may feel threatened by the Semco way because it means the end for the manager old-style with his many privileges, extremely high salaries, and bonuses.